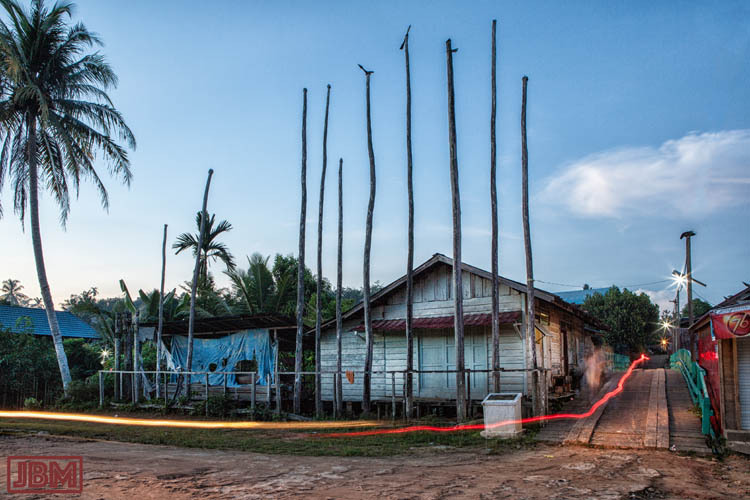 After Tumbang Anoi and Tumbang Korik, the final destination on our ‘Tur Tiga Betang’ (our ‘Three Longhouse Tour’) was the Betang Toyoi in the village of Tumbang Malahoi. Malahoi is located in the upper reaches of the Rungan River, which we consider to be ‘our’ river, as it runs by here where we are living, downstream at Sei Gohong. It’s about 122km to the north of the provincial capital of Palangkaraya. 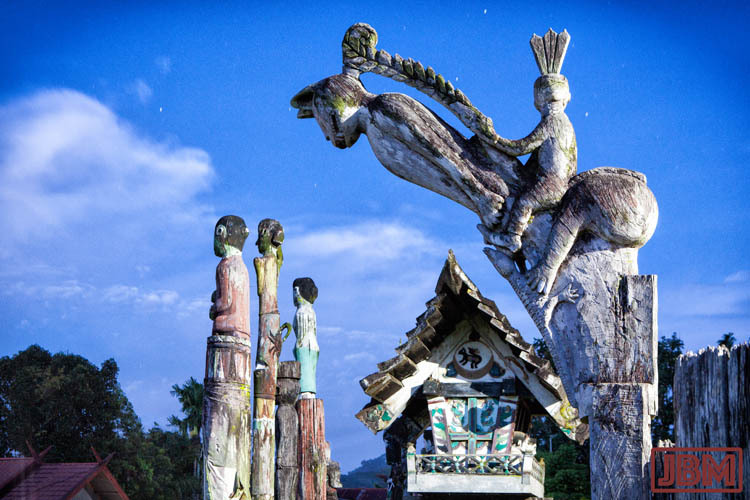 It’s a very interesting Dayak Ngaju village, home to large numbers of Kaharingan sandung (ossuaries), sapundu (carved ceremonial poles) and tall pantar panjang (like the hornbill-topped pantar above left). 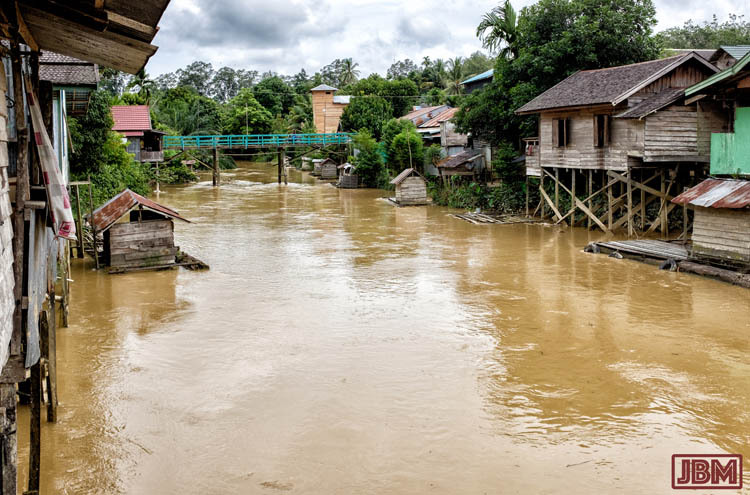 Despite its name, the village of Tumbang Malahoi is not on the Malahoi River (as you were no doubt thinking…), but in fact is at the junction of the Baringei and Rungan Rivers. 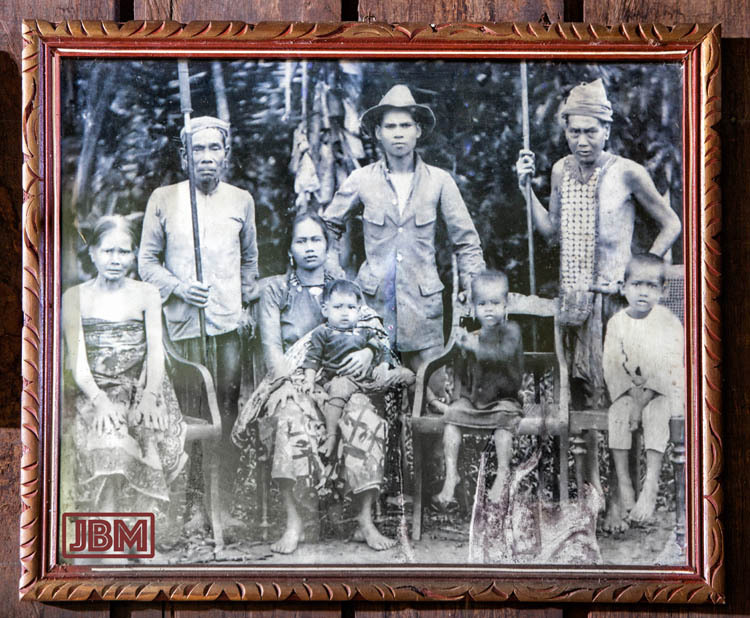 The reason for this discrepancy is apparently that the founders of the village (the Toyoi family, who also built the longhouse) originally came from West Kalimantan near the headwaters of the Melawi / Malahoi river. They wanted to retain their connection to the ancestral homelands, and even brought some soil and water from there to help maintain the link. Whatever the name, it’s an attractive river, and full of water when we were there in the middle of the wet season. 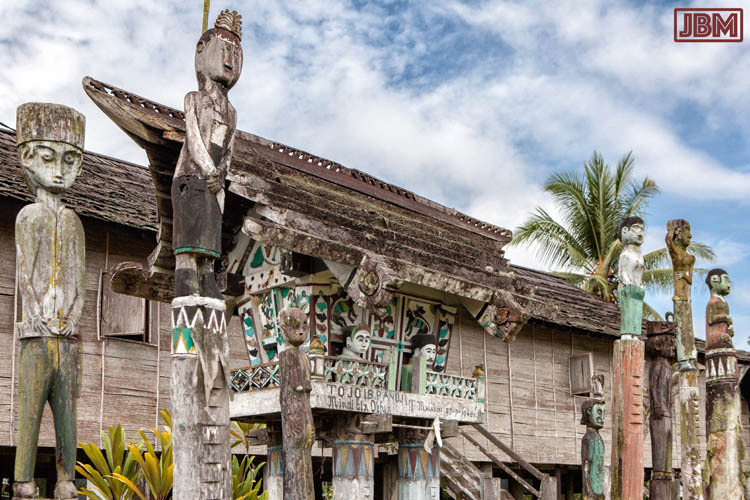 Tumbang Malahoi is best known for its lovely and well-preserved old longhouse (called a betang in the Dayak Ngaju language). Construction of the Betang Toyoi was completed in 1869, after a year of work by the community (gotong royong). Since then it has housed many generations of the Toyoi family. It’s hard to imagine now… but this place has HISTORY. Nowadays it’s a peaceful place, maintained by a warm and gentle family – themselves descendants of Bungai Toyoi. Head of the household is 59-year-old Ibu Aniema Nanyan Toyoi (but known as Mina Indu Boni). She lives there with her elder sister (Mina Indu Gandi) and mother-in-law Tambi Indu Erie, along with her 34-year-old son Boni and Tri Septiani, his wife of three years. They were friendly, generous and entertaining hosts over the three nights we stayed there. Just inside the entrance of the betang are six illustrated panels, carved and painted into the ceiling. Just outside the door are another four panels, on the underside of the eave. 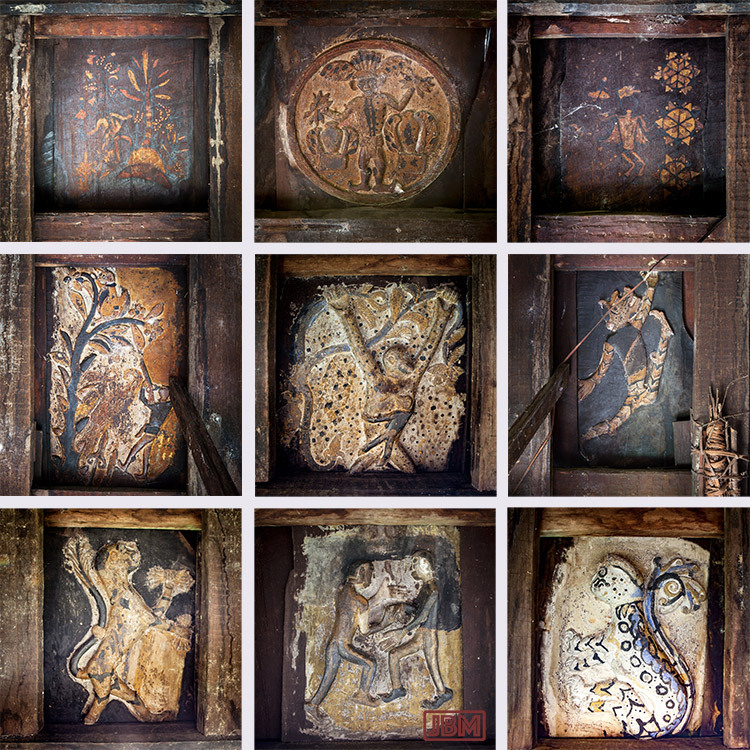 These ten panels (yes, I know there’s only nine in the photo above) relate to stories of the family’s past intertwined with symbols from Ngaju mythology and encounters with the spirit world. 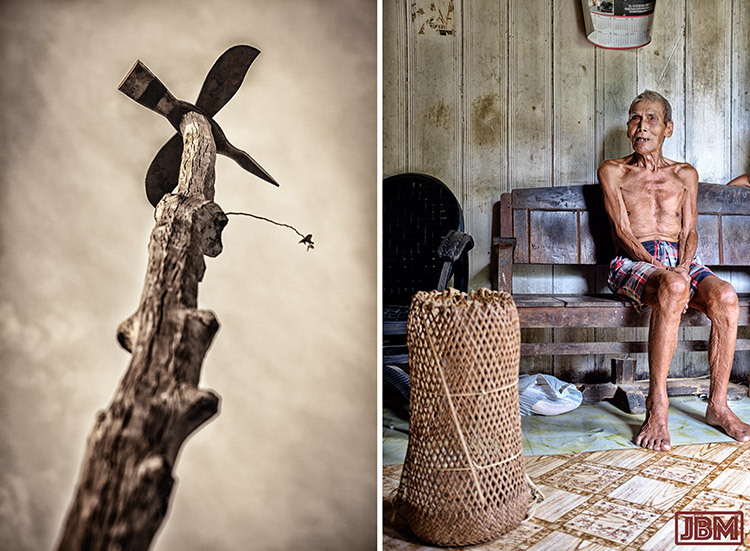 The tree in the panel at top left in the above photo, for example, is the Sawang Ngandang – the ‘Tree of Promises’. It is so called because of its use in wedding ceremonies, where the bride and groom exchange their promises before God, family and nature. The panels are considered to be significant enough that reproduction drawings have been made and are on display at the Museum Balanga in Palangkaraya. Mina Indu Boni has carefully written, in 62 pages of neat longhand, a valuable and detailed account of the history of the longhouse, the Toyoi family tree, and descriptions and explanations of the panels and various sculptures at the betang. It’s mostly in Bahasa Indonesia, but with chunks of Dayak Ngaju language also. She kindly allowed Karen to make a copy, and we are now keen to get assistance in translating the large sections that we don’t fully understand! There is usually only a single entrance to a betang, via a log with steps cut into it (known as a hejan). The hejan at Tumbang Malahoi features two stunning patung (statues), one on either side, about 2 metres high. Each one depicts a tiger (harimau) with a Dayak warrior sitting astride it, and a crocodile (buaya) crawling up. The patung harimau at Tumbang Malahoi are old, but in fact they are only reproductions of the original statues, which have been removed and are safely stored within the longhouse. Which is just as well. Just six days before we arrived at Malahoi, and during a loud thunderstorm, thieves came in the night and took the companion statue to the one above, by sawing it off at the base. Sadly, such thefts of Dayak sapundu and patung are not uncommon (we were shown another sapundu that had been sawn off when we in Bangkal village). They are likely to be ‘commissioned’ thefts, with the objects stolen to order for some wealthy collector. The rewards for the thief must be great, because in Indonesia, getting caught while committing a property crime often results in swift, summary and brutal punishment. 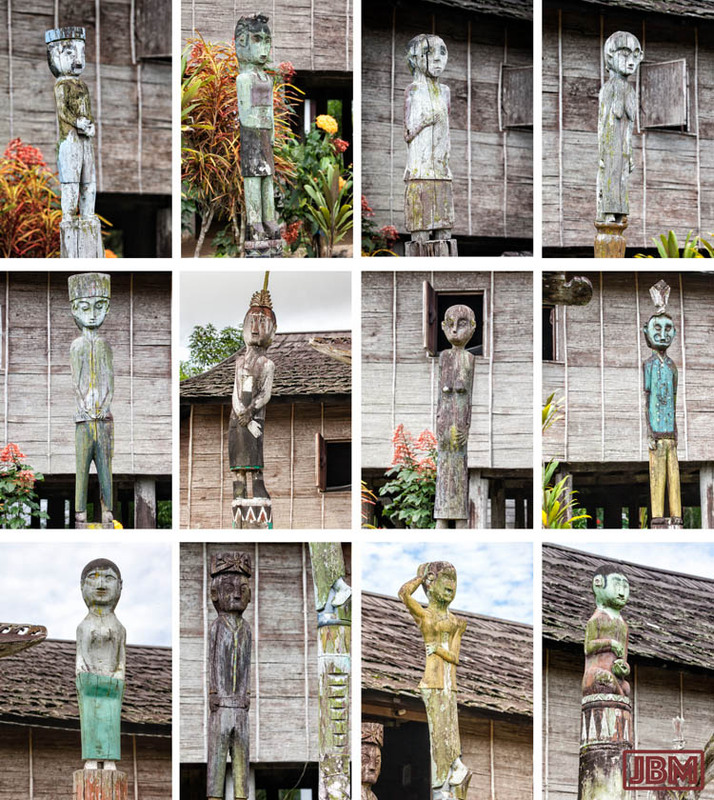 A dozen sapundu pillars, each one carved from a log of kayu ulin (Bornean ironwood), stand in a row in front of the betang. I took a series of ‘portraits’ of them – partly as a record in case any of them get stolen like the harimau statue. As the evening descended, the row of pantar across the road from the betang were nicely silhouetted against the darkening sky. 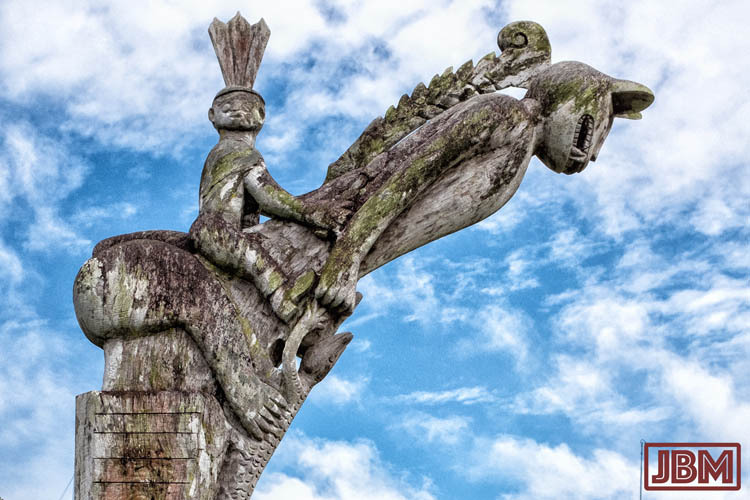 The pantar (made from kayu ulin, of course) have been described to us as ‘highways to heaven’, symbolised by the flying hornbill bird which sits on top of most of them. We understand them to be erected to honour the life (and death) of some particularly notable member of the community. As I was taking this photo, a motorbike came down the road from the left side, then turned to cross the bridge. With a 20 second tripod exposure, it laid down a light trail of its headlight transforming into a red taillight as it passed. It was getting dark, and stars started to appear – and the mosquitoes too!. So we went back inside for dinner, leaving all of the sandung, sapundu, patung harimau and the pantar panjang to watch over the Betang Toyoi longhouse at Tumbang Malahoi. This entry was posted in Indonesia and tagged Betang Toyoi, Central Kalimantan, Gunung Mas, Kalimantan Tengah, pantar panjang, patung harimau, Rungan River, sandung, sapundu, Sungai Rungan, Tumbang Malahoi. Bookmark the permalink.